Walktax Thread Distance Measurer has a high quality counter that ensures accurate distance reading for many seasons. Every detail in the Walktax is quality proven, functional and rugged. 100 % cotton thread biodegradable will not cause damage to wildlife, yet be strong enough to withstand a normal measuring operation. 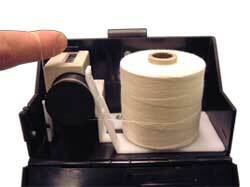 Construction that allows you to change thread reel in a few seconds, even with gloves on!